Saint Pattinathar was born in a wealthy family and yet he turned to be a Sanyasi. He was known also as Thiruvenkadar. It was said that even when he was a youth, Lord Siva appeared in his dream and directed him to go to Thiruvengadu, where he would meet his Guru. Pattinathar has given us his experience and wisdom in the form of hyms. 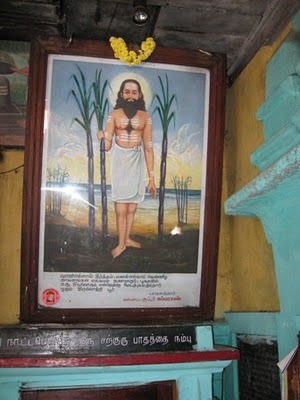 His works include Thirukazhumala Mummanikkovai, Thiruvidai Marudhur Mummanikkovai, Thiruvegambamudaiyar Thiruvandhaadhi and Thiruvottriyur Orupa Orupadhu. Pattinathar was born in Kaveripumpattinam in a very wealthy family. His parents were Sivanesan Chettiar and Gnanakalai Aachi. They were so wealthy, that in those days it was a customary that kings of the various dynasties and empires who rose to the throne will be crowned by the wealthiest in the country. And for three generations or more, Pattinathar's ancestors have crowned the kings in the Chera, Chola, Pandya and the Pallava Kingdoms. That would give us an understanding of how wealthy their family should have been. They had a lot of ships that sailed across to various countries in the globe for trade purposes. As a kid, he spent most of his time playing and studies was a far distant thing to him. Pattinathar's father was worried that his son does not study well, but his mother convinced him that they had wealth that would feed more than 10 generations, so why worry about their son not studying. A few years later, Pattinathar's father died and his mother had to take care of business. Though she was able to manage that, her brother - Pattinathar's maternal uncle - gave her a helping hand and looked after the business. Being born in the lineage of traders, he had the skills for trade. He wanted to venture into the seas to get more hands-on experience about trade across the oceans. He became well-versed and later he was married to a girl named Sivakavi at the age of 16. In those days, marrying at a young age was practised. Over the years, he grew to be a man who can handle businesses himself and became the wealthiest trader in Kaveripoompattinam. Thereafter he was referred to as Pattinathu Chetty or Pattinathar. For a long time, the couple did not have a child as the heir to their wealth. They went to a lot of temples but still God did not bless them with a child. They were worried. It is said that once Lord Siva appeared to them in their dream and promised a child. In the dream an elderly couple showed them the way. He woke up from his dream and the next day Pattinathar and Sivakalai headed to Thiruvidai Marudhur. And when he reached Thiruvidai Marudhur, he saw the same elderly couple that he saw his in dreams. He enquired about them, and they said that they were poor and the child was born at a very later age, and now they are weak to feed for themselves. So they both decided to go and meet Pattinathu Chetty and ask him to adopt the child for which, the elderly couple told, that Pattinathar would give them gold equal to the weight of the infant with which they could manage the rest of their life. Pattinathar and Sivakalai eyes were in tears and they thought that Lord Shiva and Parvathi themselves came as the elderly couple and blessed them with the child. Then Pattinathar and Sivakalai, took the elderly couple to Kaveripoompattinam and said that they will adopt the child and gave the elderly couple a good amount of wealth for them to survive through their age. Then they planned for the adoption ceremony of the child. Now, Pattinathar's sister, who thought that the wealth of Pattinathar will automatically be for her family as Pattinathar had no heir, had her dreams shattered by the adoption of this child. She argued and quarrelled with his brother. But Pattinathar made a firm decision that he is going to adopt that child and that child will be his heir. The adoption ceremony went very well in all its grandeur and they name the baby boy - Marudhavanan. They considered Marudhavanan as their own child and showed him a great love and affection. This was regarded by Pattinathar as Gnanopadesam, the word of enlightened advice from Lord Siva Himself. This incident was the turning point on the life of Pattinathar; in other words it was enough to spark off the divine glow or awareness in his mind and heart. On realizing that Marudhavanan was in fact not a normal human and was Lord Siva who came in the guise of human form, Pattinathar decided to renounce the world. He entrusted al his wealth to the care of ‘Kariarsthan’ the personal assistant by the name of Nangur Senthanar. Then he ordered the person to give the wealth and property away to the needy people, with just a loin cloth round his waist, he left home as a sanyasin. He had to face many troubles in his renunciated life. His relatives and dependents did not like the course of action-renunciation of Pattinathar, they induced the king of the region to take action against Senthanar who had distributed the wealth to the poor but counteracted the punishment given to Senthanar with the grace of God. In the course of his renounced life, Pattinathar gradually attained the stage of “Iruvinai Oppu” , Malaparipakam and Sakthinipatham and expecting salvation under the grace of God. He travelled many sacred places and came to Thuluva country and the king his disciple. The king in the name of Pathiragiriyaar also renounced the worldly pleasures and became a Sanyasin. 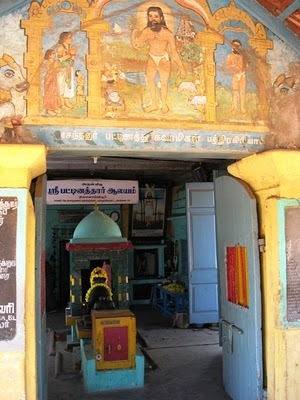 It is said that Pathiragiriyaar attained Siddhi at Thiruvidaimaruthur. Karma and birth continue one after another. Here questions arise. Is there no end to this cycle? How can the soul get liberation? Saiva religion shows the way for liberation. We should develop positive qualities and attitudes in life. Our action or Karma should be in the way of Lord Siva whose inherent nature is wisdom and attribute is love. In every birth, we gain experience through karma, and knowledge through experience. In this process the grip of Anavam, which is the source ignorance, get loosened and ultimately we become liberated from it. This process is called malaparipaakam. Also we develop the mind to take pain and pleasure, the fruits of evil and good karmas, alike. This is called iruvinai oppu. God Siva's Grace then descends on us. It is called Sakthy nippaatham. Then our actions will not be motivated by our senses which are prompted by Anava malam. They become His actions and karma will not follow us to come to experience. While Pattinathar was playing with the cowherd boys at Thiruvotriyur, he disappeared from the spot and attained Siva Sayujyam, the final liberation of the soul. It is said that the relatives including his wife came to the spot where Pattinathar attained mukthi and offered their devotion. Thanks for the good effort taken to spread the truth about Pattinathar.